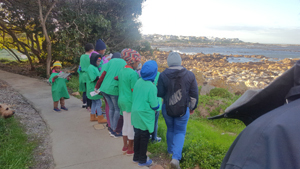 Members of BirdLife Overberg recently celebrated the first anniversary of regular monthly coastal clean-ups along the Onrus and Vermont shoreline, as well as in the Hoek van de Berg Nature Reserve. 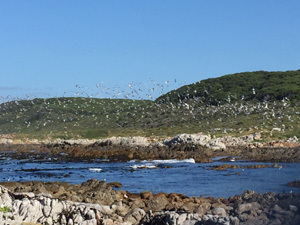 This is one of six projects forming part of the BirdLife Overberg’s CleanMarine campaign on the conservation of the Cape Whale Coast coastline and estuaries. 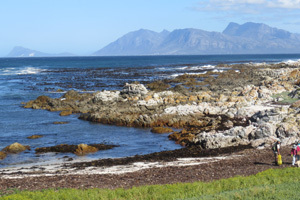 Thirteen monthly coastal clean-ups have already been undertaken and we express our sincere appreciation to Elaine Odendal and Helé Oosthuizen for managing this process. Regular contact and collaboration is being maintained with partners such as the Zwelihle Recycle Swop Shop, the Onrus Litter Ladies and the Coastal Cleanup Conservation Trust. 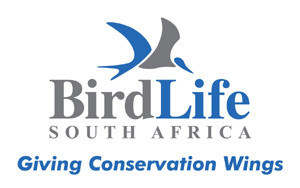 The “BirdLife Overberg Oystercatcher Hero of the Month award” was also instated honouring individuals or organisations making a significant contribution to the conservation of our coastline in general and the combating marine litter in particular. Branded refuse bags sponsored by John Kieser of Plastics SA are being used for the collection of litter and we thank him for his support in this regard. It was decided to score the contents and quantity of the litter being collected on standard sheets developed by the Oceans Conservancy, an international agency based in America. The information received from all over the world is collated by the Oceans Conservancy to gain a better understanding of the types of litter most prevalent on a global scale. These clean-ups are interesting and very rewarding. The volunteers work in groups of three or four with one person marking off the litter items being collected on the standard form developed by the Oceans Conservancy. The information gleaned from the monthly report cards was collated and we hereby give a brief overview of the prevalence of the various types of litter collected over the last year. Individual Excel spreadsheets of the littler collected are available from us, but we hereby merely highlight a few findings. Plastic beverage and water bottles were very prominent and 366 were collected, together with 443 plastic bottle caps. 356 plastic straws, as well as 769 small pieces of plastic were recorded. The latter is of particular significance as these eventually break down to become micro-plastics being ingested throughout various (even human) food chains. 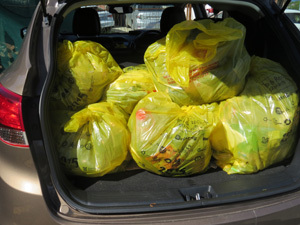 Not surprisingly plastic bags (485) and food wrappers (471) also featured strongly. All of these items essentially represent single-use plastics, indicating lifestyle issues that we all are involved in and could potentially be turned around by using re-usable replacements for these plastic items. The same applies to those who smoke as 693 cigarette butts were picked up. Fishing and angling activities also appear to be a major problem as 445 pieces of fishing line representing an estimated length of 1,608 metres were removed in the period under review. Add to this the 90 pieces of fishing net and 290 pieces of rope and it becomes evident that this is a major problem. It is very well known that birds and other animals are adversely affected and often killed through entanglement with these fishing items, a fact confirmed by international research and statistics. 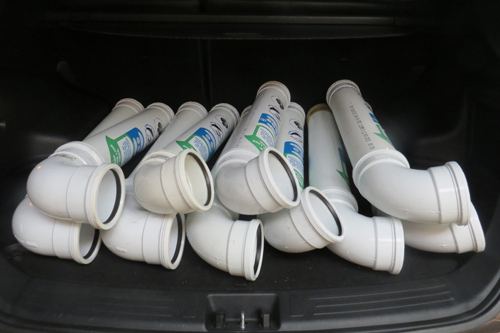 One of the other projects in the CleanMarine campaign relates to the installation of bins for the collection of fishing line along the Overstrand coastline. 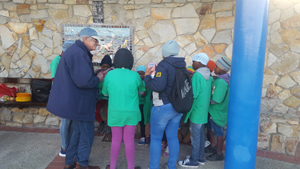 This project was started in South Africa by the Dyer Island Conservation Trust, is partnered with Plastics SA, and kindly sponsored by DPI Plastics. These bins are currently being installed all along the Cape Whale Coast shoreline and will be supported by an extensive media campaign informing the public of the negative impact of fishing line on seabirds and other sea creatures. It is important to note that the findings discussed above are consistent with those found in other parts of the world and these items appear to be a problem everywhere. One might ask “So what, what difference will the collection of 3,000 odd pieces of marine litter make?” The clean-up teams were unable to complete score sheets on some of the days that they were collecting litter. It is downright impossible to manage a clipboard with paper in a raging south-easterly wind and in many cases the sheer volume of litter, particularly amongst rocks, simply implied that it was “all hands on deck” without completing score sheets. To this should be added that Elaine and Hele pick up litter on their regular morning hikes along the Onrus and Vermont coastal path and that this is also not scored. The findings discussed above therefore represent a huge underestimation of the total stuff collected. It remains very satisfactory to deliver the many bags collected to a recycle plant, or a landfill site with the realisation that it is not along the shoreline any longer, potentially negatively affecting birds and other wildlife. An interesting local issue that probably relates largely to abalone poaching is not reported in international findings. An astonishing 532 condoms and wrappers were picked up in the period under review – the poachers apparently use condoms to protect their cell phones when they enter the sea. Significant numbers of “dikidiki lights” used for diving at night, and several flippers and wet suites also formed part of the litter collected. Say no more! 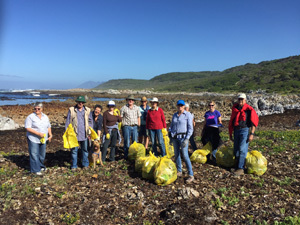 The efforts of the BirdLife Overberg coastal clean-up team, together with the sterling work of the Onrus Litter Ladies, are certainly making a significant difference to the cleaning of the coastline at Onrus, Vermont and the Hoek van de Berg Nature Reserve. Antonio da Silva-Swart’s contributions through the Coastal Cleanup Conservation Trust further contribute on a wider scale. The question that arises is what other organisations in other areas along our beautiful coastline could do to improve the quality of our seashore. One is tempted to encourage and even challenge other environmental and cultural clubs and organisations, church groups, rate payers associations and the like to become involved in similar actions along their local coastal patches. Surely we can all contribute to a better quality of life for man and beast along our beautiful Cape Whale Coast’s beaches and rocky shores? 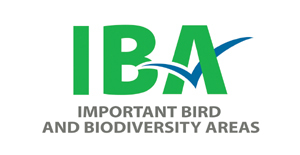 As always these types of projects are dependent on sponsorship and we acknowledge the generous seeding funding contributed by the Important Bird and Biodiversity (IBA) division of BirdLife South Africa in this regard. We appeal to like-minded members of the public and environmentally conscious agencies and organisations to donate towards this important cause in view of sustaining the CleanMarine projects in the short, medium and long term. 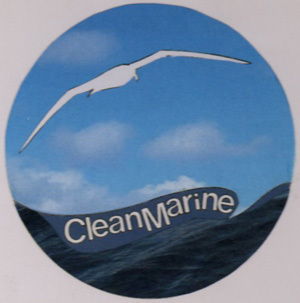 Also like the "CleanMarine at BirdLife Overberg" Facebook page to receive regular news and updates on progress with our projects. All correspondence to Anton at birding@overberg.co.za or sms at 082 550 3347.